Your Emile Henry Grill Stone allows you to cook your kebabs or to grill all kinds of food onteh barbeque, even the most delicate. 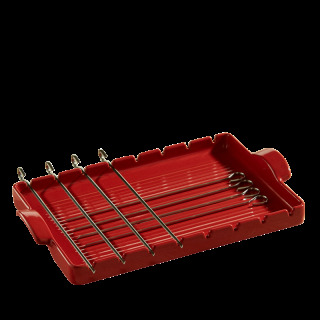 Preheat your barbeque while preparing your kebabs. Create original and tasty kebabs by alternating 2 different textures and flavours. Place your skewers in the notches provided. For even tastier kebabs, you can brush them with a mixture of olive oil and aromatic herbs or spices. If you don't cook 8 kebabs at the same time, you can fill the space with other ingredients. They won't come in direct contact with the harmful fumes from the barbeque smoke. Place the Grill Stone directly on the barbeque grill (charcoal or gas). Make sure the heat is evenly spread out if using a charcoal barbeque. Once cooked, you can serve the Grill Stone directly on the table, which will keep the contents hot throughout the meal. You can also use the Grill Stone in the same way in a traditional oven. You can use your Fish Grill directly on the barbeque grill (charcoal or gas), or in the oven. 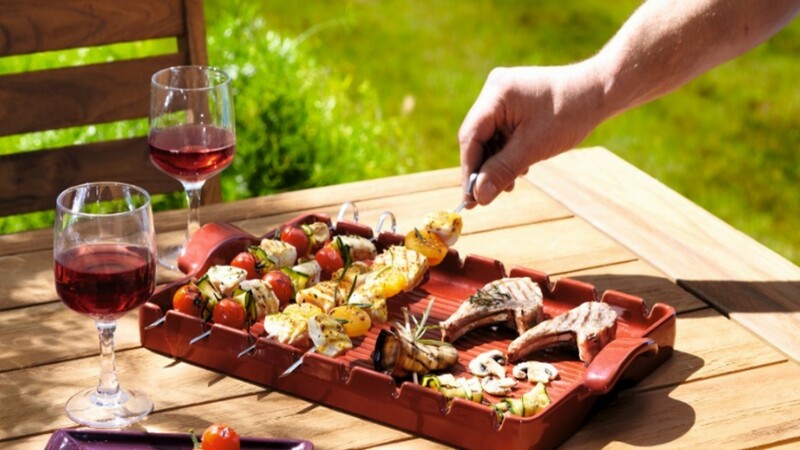 Our BBQ ceramic is extremely resistant and can reach temperatures up to 500°C/1000°F ! Make sure the charcoal is evenly spread out before putting your Grill Stone on the grill. The Grill Stone is for oven or BBQ use only. Do not use on the stove top or on any other source of direct heat.